Antiquing: add $1,000 - $2,500. California residents add 8.125% sales tax. Additional charges apply to custom personalizing of instruments. Please contact me for information about special commissions. 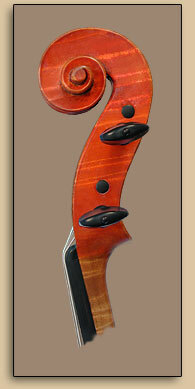 Yes, I do have a waiting list for commissioned intruments, but I also have instruments in my shop for sale. I try to keep a few on hand for those musicians who can't or don't want to wait for a commission. Please contact me to learn about the waiting list and currently available instruments. How do I compare the sound of your instrument with others? I advise musicians who are trying out instruments to bring some trusted colleagues along and compare instruments in a hall whenever possible. Listeners in the hall should sit in the worst â€“ not just the best â€“ places acoustically. A great instrument will shine no matter where one sits; others will not. When listening, have a player play short notes as well as long notes; good players will quickly adjust with long bow strokes and may find themselves able to make bad instruments sound good, but an inferior instrument will not be able to hide behind short bow strokes. Qualitative differences between instruments will be magnified when compared in these ways. I love your instrument now, but how will it sound in six months? In five years? Every time a player acquires a new instrument (old or new) an intimate relationship is begun, and it takes time for the player and the instrument to get acquainted with one another. A brand new instrument must compete with the very best of the old master instruments; it must sound great from day one. A buyer should never buy an instrument with the hope that it might improve in tone over time. I always advise, "Love it now, and because it's well-built â€“ not too thin and not treated with caustics in order to imitate age â€“ "it can only improve with the passage of time." Nobody builds old instruments. All new instruments "settle in" with time. The settling process varies depending on the instrument and the amount of time spent playing it. Generally, the sound-post needs replacing within the first two to three months and then again after a year. After that the instrument becomes more stable. Even old instruments that haven't been used much go through this same process once they are played again. Yes, I guarantee my instruments completely. I take pride in them, and they are my best advertising, so it's in my interest as well as yours that they always sound and perform at their best. To this end I always take care of an instrument until it is "settled in." After this period I like to do sound adjusting on all of my instruments at no cost to their owners. In addition, all my work comes with an unconditional lifetime warranty (my lifetime). Should a problem ever develop with an instrument of mine that is due to my own workmanship or choice of materials, I will correct it free of charge. How does the shipping work? What about insurance? If I send you an instrument of mine, I bear the one-way expense of shipping it to you (FedEx Next Day Air). If and when you return it, I ask that you also use FedEx Next Day Air â€“ packing the instrument as you received it â€“ and that you assume the cost of shipping it back to me. This is standard practice in the trade. The instrument will be insured by me at all times. To make it convenient for you, FedEx will come to your door to pick up the shipment. 1-800-GoFedEx (800-463-3339).